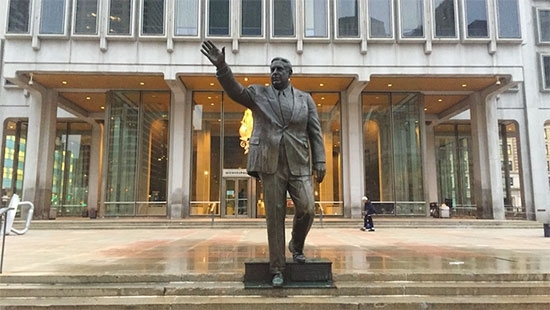 The City of Philadelphia announced today that it has decided to move the statue of former police commissioner and mayor Frank Rizzo from its current spot across from City Hall. The statue has been located on steps in Thomas Paine Plaza in front of the Municipal Services Building since it was unveiled in 1999. Protests and vandalism calling for the removal of the statue grew to a head this summer. The city received almost 4,000 submissions to a questionnaire asking what should be done with the statute; either keep it, remove it, or move it. "Earlier this year we initiated a call for ideas on the future of the Rizzo statue. We carefully reviewed and considered everyone’s viewpoints and we have come to the decision that the Rizzo statue will be moved to a different location," said Michael DiBerardinis, the city’s managing director. The city did not announce a new location for the statue. They said it will taken them six months to put together a proposal to send to the Art Commision. "We thank the citizens of Philadelphia for responding with such thoughtful ideas. The response was very helpful for us to identify a host of potential new locations. We plan to do our due diligence on these locations before announcing the new site, but the input helped shaped some of the options we'll review," said Kelly Lee, Chief Cultural Officer, in a statement. "Our goal moving forward is to seamlessly relocate the statue to a new, more appropriate public location in the city." A man and woman were found dead of gunshot wounds in a parked SUV in Port Richmond last night in an apparent murder-suicide. It happened after 10 p.m. Thursday on the 3500 block of Amber Street. Police say that the 49-year-old man in the passenger seat shot the 37-year-old woman sitting the driver's seat before turning the gun on himself. Both were shot in the head and were pronounced dead at the scene. A handgun was found in the car. The couple apparently has a history of domestic violence. Their identities have not been released. Pennsylvania Governor Tom Wolf has signed a bill that would enforce stricter penalties and give the Pennsylvania Liquor Control Board more authority to shutdown so called "stop-andgo" stores. These nuisance stores often do have liquor licenses but violate the terms of the code. They may have a restaurant license and sell little more than shots of liquor and beer but no food. The establishments themselves do not have bathrooms, seating for 30, and fail health inspections. The PLCB now has the ability to immediately suspend the license of a business that is harming the community. They can also act on reports from police and health officials. In Philadelphia, L&I will step up to help with enforcement and inspections.